Customers often find retailers online using Google. For example, type “laptop” into the wildly popular search engine, and you will quickly see web links related to laptop computers. Some of those are “sponsored links,” also known as retailer ads. Those retailers paid Google to display their links in searches for that keyword. This sponsored search advertising is popular with retailers and provides much of Google’s revenue. The tech behemoth took in some US$24 billion in 2016 from the United States alone — about 76 per cent of the country’s search ad market. That popularity means it’s important for online retailers to understand the advertising process. What factors help links appear first on the page? Are some retailers better at this critical competition for visibility? Furthermore, some ads are for Google’s own retail site. Does that matter? Should we be concerned that Google has several ways to influence which ads we see? Search advertising requires many decisions. Should retailers sponsor just a few keywords, or many? Which ones should they choose? How much money should they offer to pay Google for each word? These decisions matter because customers click more on links near the top of the page. The first link displayed can have double the “click-through” rate of the second one. Research at our school, The Goodman School of Business at Brock University, found that some firms are much better than others at managing this visibility challenge. Among online-only retailers like Amazon, the greatest differences are in search rankings. The best firms get their ads nearer the top at relatively lower costs. Among retailers like Staples that are multi-channel (meaning they also have bricks-and-mortar stores), the biggest differences instead are in the rates that consumers click on links and buy products. The best firms get more clicks and more sales per ad dollar. Surprisingly, multi-channel retailers tend to be more efficient overall than the online-only ones at search advertising. A second study examined how popularity, payments and competition affect rankings. Not surprisingly, popular retailers tend to rank highly in search results. Retailers offering to pay Google more per word also rank higher. Those payments have more influence on search rankings for obscure web pages than for popular ones. Popular sites tend to rank highly regardless of the payment they offer Google. When multi-channel retailers like Staples face few competitors for keywords, popularity and payment have a large impact on their rankings. But when there’s a lot of competitors, multi-channel retailers tend to fall down the page. They seem to rely more then on their physical stores and less on the web. Online-only retailers don’t have that option, and seem to sponsor links regardless of the competition. Popular online-only retailers generally appear high on the page no matter the number of competitors. Similarly, competition seemingly does not affect the payments they offer. Google also places ads elsewhere in its AdSense network, such as on the web pages you visit. It chooses those ads partly by tracking your previous searches. For example, if you searched for “laptops” earlier, you’ll likely see ads for laptops on subsequent websites. Google also places ads in its free version of Gmail. It chooses those ads in part by scanning your emails’ contents. If you’ve been exchanging messages about laptops lately, you’ll likely see ads for them there. Google recently announced plans to end that scanning, however, due to the confusion it’s caused for its paid Gmail users. The company influences online ads’ visibility in other ways too. Its search engine prefers sites that work well on devices like smart phones. Its Chrome web browser will soon block annoying ads that pop-up on the screen or that auto-play noisy videos. 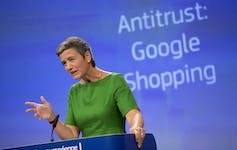 Margrethe Vestager, the European Union’s competition commissioner, speaks at a news conference in Brussels in June. The EU has fined Google over its online shopping service. Google has a lot of control over what we see online. It’s one of the ethical questions that all search engines raise. An added concern here is that Google sells products through its own Shopping site. That means it competes with companies that it advertises, all while controlling whose ads are easiest to see. When European Union regulators investigated this potential conflict of interest, they found that Google Shopping links tend to appear much higher in Google searches than those of rival marketplaces. The EU is therefore fining Google’s parent company, Alphabet, US$3.6 billion for antitrust violations. The EU is also investigating the company for requiring other search sites to show Google ads. A third inquiry is examining the firm’s insistence that all Android devices give priority to Google over other search sites. More fines could follow. Google is involved in yet another controversy this week over its funding to law professors whose research favoured the company’s practices. That funding was not always disclosed. Google argues that it simply gives consumers what they want. Nonetheless the allegations suggest that Google may have forgotten its onetime “Don’t be evil” motto. It’s worth watching whether this ethical and legal controversy will harm either its brand image or its profits.